Steep, wooded slopes above the Hudson River, with a connection to Walkway Over the Hudson Historic State Park. 250 acres of ridgeline and steep, wooded slopes just south of the Mid-Hudson Bridge overlook the Hudson River and the city of Poughkeepsie. This open space was preserved by Scenic Hudson in 2003 and transferred to New York State parks department in 2006. A trail connects it to the Walkway Over the Hudson Historic State Park. About 2.5 miles of carriage trails and footpaths criss-cross this park's 250 wooded acres. The White Trail long loop (1.76 miles) is the recommended hike in the park, although note that several "scenic overlooks" along it are seasonal (views limited by abundant trees). For a truly spectacular view the scenic overlook on the Blue Trail is unencumbered and very worthwhile, do not miss it. 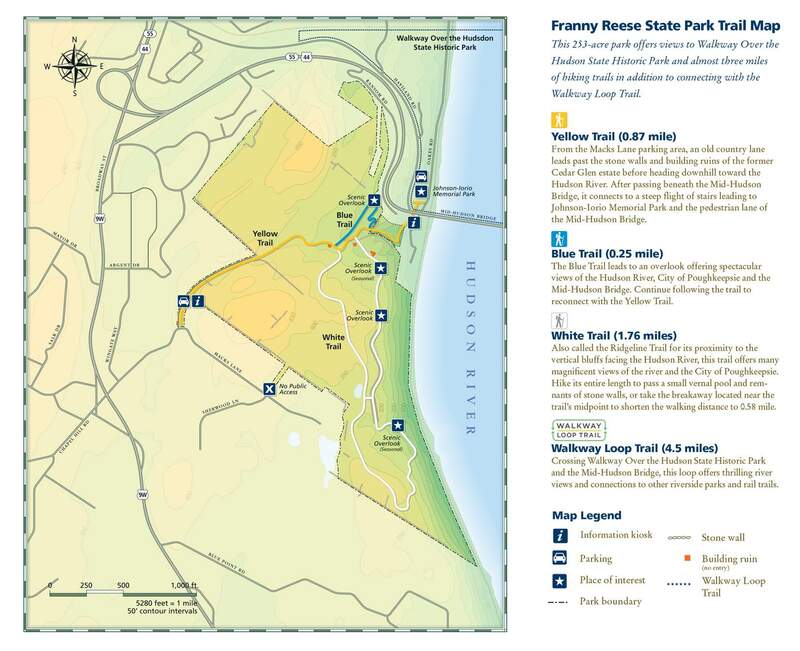 Use the Web Map link on this site to view a trail map with a synopsis of four blazed trails within the park, and the "Walkway Loop Trail" (3.6 miles) extending beyond it. Click to view hike descriptions that start from either the east shore or west shore of the Hudson River. Crossing Mid-Hudson Bridge from east to west, take Route 9W north and take first right onto Haviland Road. Parking area for Johnson-Iorio Park is located at the end of Haviland Road. From parking area, descend stairs and turn right to cross under Mid-Hudson Bridge. Trailhead is on the right. Or from west side of Mid-Hudson Bridge, take Route 9W south for 0.8 mile, then turn left on Macks Lane. Park entrance is 0.3 mile on the left. Take the Metro-North Railroad (Hudson Line) to the Poughkeepsie train station. Connect to the Walkway Loop trail and cross either of the bridges over the Hudson River. When you reach Johnson-Iorio Park, descend staircase, turn right to pass underneath Mid-Hudson Bridge and you are on one of the park's carriage roads. Limited weekday bus service from Kingston to Highland on (9W) is available via Route G . Also bus service from New Paltz to Highland is available via Route H.Ulster County Area Transit, www.co.ulster.ny.us/ucat (888) 827-8228. Ulster County Area Transit also offers bus service from the Metro-North station in Poughkeepsie to Highland to New Paltz and Rosendale via their Ulster-Poughkeepsie Link. "Over the River and Into the Woods" by Georgette Weir features a hike in this park. See the January/February 2010 issue of the Trail Walker, page 12.